As I have probably eluded to before, my kiddos are not exactly known for their multiplicative prowess. Every chance I get, I try to throw in a fun activity to help them practice without feeling as if they are using flashcards. 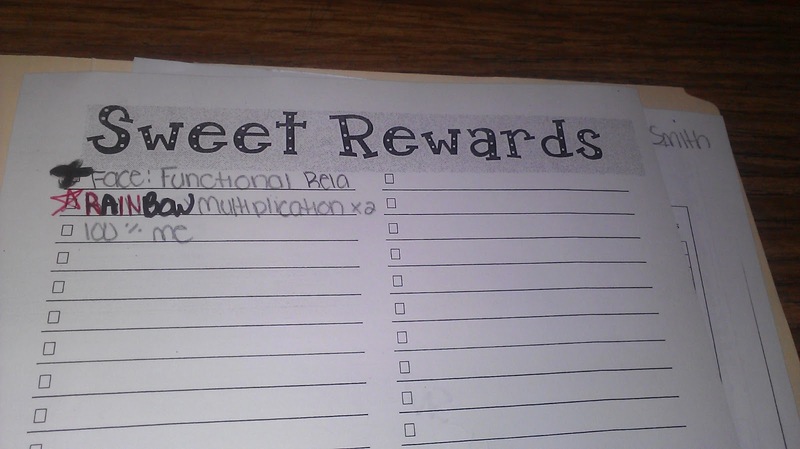 I was searching for some fun new tasks to add to my Sweet Rewards activity repertoire and came across HoJo’s multiplication square freebie. The square puzzle concept is a very simple one. Students match the edges of the squares together so that the problem of one square matches the answer on the other square (think dominoes). I also printed out a 4×4 template for students to use because they aren’t very spatial and couldn’t “picture” what the finished 4×4 product would look like. (I realized this pretty quickly once I showed it to the students and they were making funky crazy shapes with the squares! – lesson QUICKLY learned)! 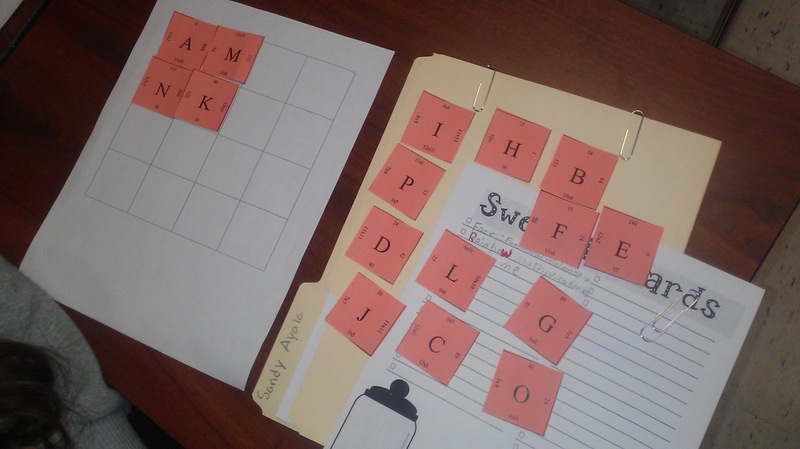 First students grabbed a pack of pre-cut squares that were paper-clipped together. Then students started matching their puzzle pieces together. 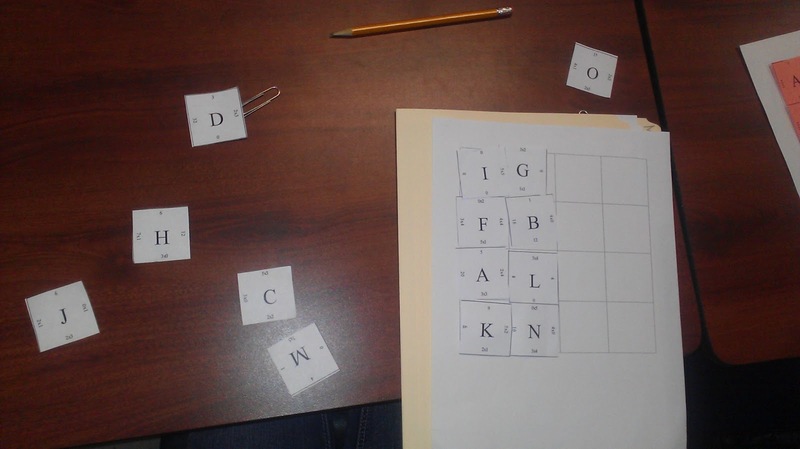 Students used different strategies to work through the puzzles. Some saw smaller pieces that fit together (BFE on the right of the picture) but weren’t ready to be placed on their board. Soon, students had all the pieces fall into the correct place! 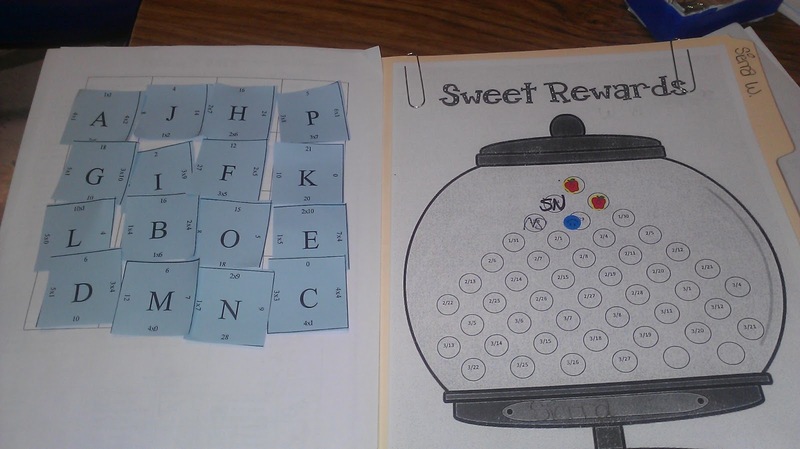 (I’m learning that organization is WAY MORE key in my resource class with my new sweet rewards system than it ever was before!). 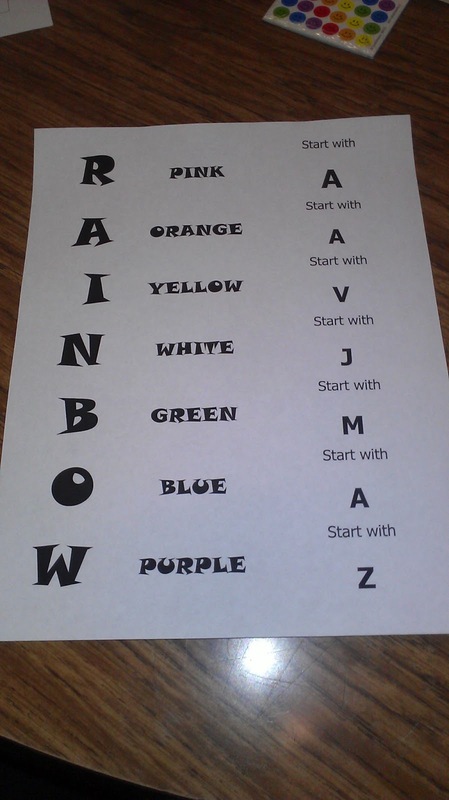 Students each grabbed a different color to work on and I would out outline a different letter each time they successfully completed a puzzle. 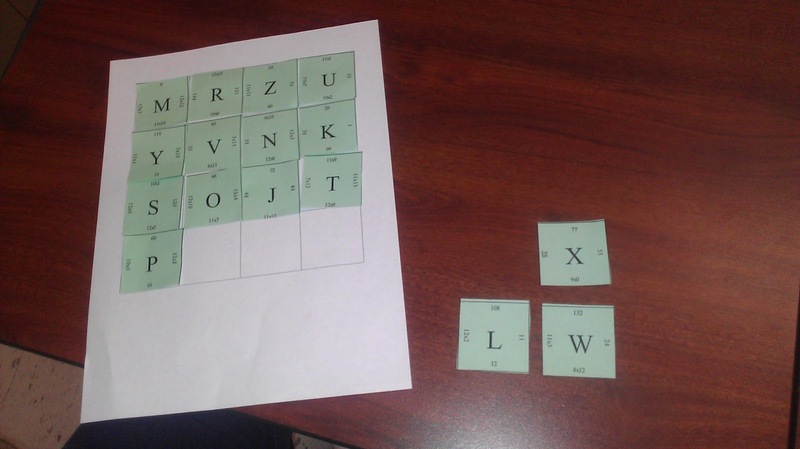 This was a guide to keep the students (and myself) straight on which puzzles they had and had not done. The letter on the left represents the highlighted letter on their sweet rewards page. The letter on the right is the top left box of the 4×4 square. The color in the middle was the color paper that the puzzle was printed on. For kiddos that aren’t great at multiplication, I had them work on smaller puzzles that focused on knowing the 1,2,3 facts or the 4,5,6 facts. Students who were stronger concentrated on 7,8,9 and 10,11,12 or the mix review first. Some kiddos zipped through these puzzles, some took days. 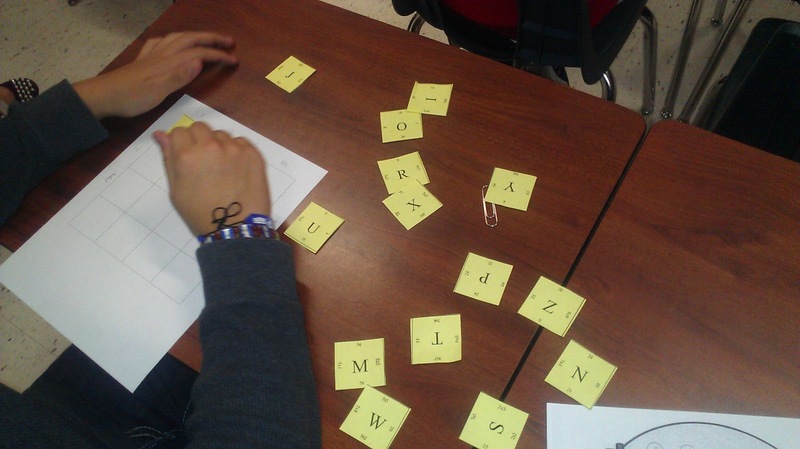 Regardless, each student found success in the puzzles. They were able to use different strategies and “context” clues on the sides of the pieces to help them make the puzzle fit together correctly. In the end, this was a HUGE hit with my kiddos and I can’t create to find more activities like this one using different concepts! Do yourself a favor and make sure to stop by HoJo’s teaching adventure blog for new, exciting ideas to use in your classroom! She also has an amazing TpT store that you should check out as well! Categories: freebie and mathematical engagement. This is an amazing shout out! Thank you! I’ll start sharing it around my networks soon. 🙂 I’m so glad your students enjoy my products!! Heather! Thanks so much for stopping by! I really appreciate your networking with me! That’s a GREAT activity!! I”m going to check it out right now! My kiddos loved it! I hope yours do as well!